I’ve been a pastor for about a decade and there have been plenty of surprises along the way- aspects of my job I hadn’t associated with the pastorate. Most of these I’m now accustomed too but one continues to catch me off guard: pastoring those who are leaving the Faith. Having grown up in a believing family I’ve known for most of my life that people leave Christianity though I imagined these departures taking place quietly and quickly. We spoke of those who had “fallen away” from belief as one disappears over a cliff. In fact, as I continue to learn, leaving one’s faith is less of a fall than it is a slow, laborious trek during which the destination is rarely visible or certain. 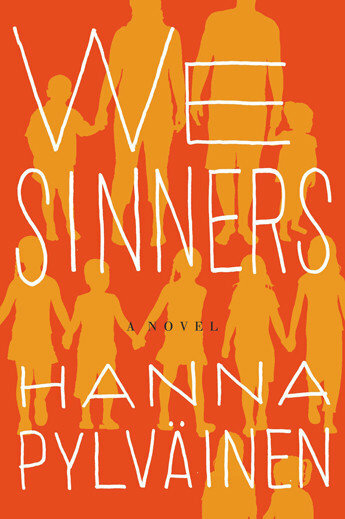 Hanna Pylväinen’s debut novel, We Sinners, captures what I imagine to be the experience of so many leavers (and returners). Borrowing heavily from her own experience growing up in a large family that belonged to a fundamentalist sect of Finnish Lutheranism, Pylväinen repeatedly finds the right sentence to describe the crises of faith inherent to religious households. The story advances over eleven chapters, each told in the voice of a different family member. While the theology and experience of Rovaniemi family differs wildly from my own, the author still managed to evoke great sympathy and memory through this family of believers and doubters. The corner of Christianity I inhabit can seem obsessed with leavers. We track statistics and know pollsters by name. Books are written to tell us what it all means and we try to envision a future where more people identify their religion as “none.” What this entire industry misses – and what Pylväinen gets – is that discussing the goings and comings of faith with data and demography is neither interesting nor especially helpful. It is the stories that matter, the unfolding narratives of people who claim and are claimed by their belief, unbelief, and oftentimes both simultaneously. We Sinners beautifully and painfully reveals the pulse behind much lifeless so-called analysis. Most readers will not directly relate to the large family or isolationist tendencies of the Rovaniemi’s church. But the resonance is there, felt through the characters’ doubts and hopes, their moments of shame and forgiveness. In this way Pylväinen’s novel is for believers and doubters, the leavers and those who remain. Most impressively, it’s a story that eschews the obtuse categories of religious pollsters and acknowledges the more complicated and interesting experiences of real people whose faith – or lack thereof – cannot be so easily categorized.